Have You Tried The Gelato Shakes At This Dessert Parlour Yet? Chennai’s first gelato shake bar in OMR and Kandanchavadi has some amazing shakes you must try ASAP. The gelato shake bar in OMR reminds us of cute ice cream parlors, with purple themed interiors and fun doodles across their walls. Don’t forget to leave them a sticky note and contribute to their colourful glass window, like we did! Said to be made truly Italian style, Tempteys gives a twist to our favourite gelato ice creams. Now you can drink them up in all kinds of flavours. We found some classic and really quirky ones that come with plenty of toppings too. Peeps, try their Snickers Gelato Shake. 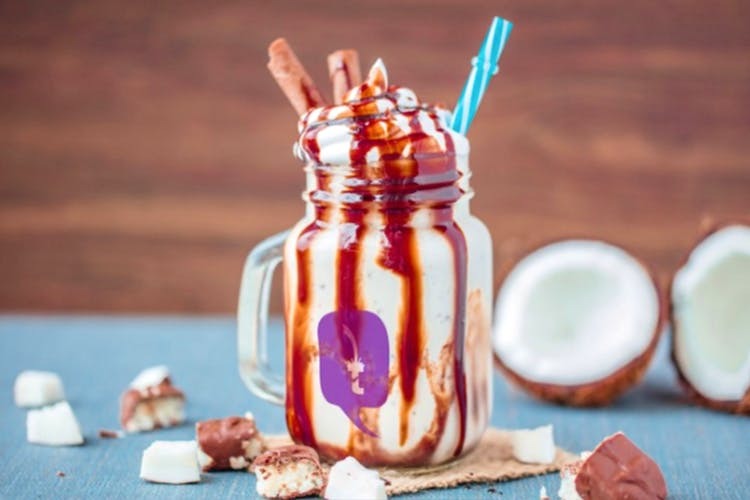 The thick shake is loaded with chocolate, plenty of cream on top and enough Snickers bars to satisfy your chocolate-and-peanut-craving taste buds. In their classics section, we loved their Awesome Oreo topped with chocolate syrup and the Naughty Banana that comes with chunks of banana and peanut butter with ice cream. The Mr. Cake Frutti is another delight to have; it comes with strawberry shortcake, tutti frutti toppings, strawberry syrup and more. Slurp! They also have your other favourite chocolates in gelato shake form. From Kit Kat to Mars, Bounty, Ferrero Rocher, and even Lindt, they have it all. You could also choose from their line up of Classic and Premium shakes and make it yogurt-based if you like, especially if you’re keeping an eye on your diet. Speaking of, there is plenty of protein shakes like Ola Granula, Carrot & Cucumber and Green Tea Mania to choose from too. Psst, since it’s summer maybe you’d want to check out their Oreo Minto and Mango Moon, delicious drinks to keep cool this summer.